Hi friends! 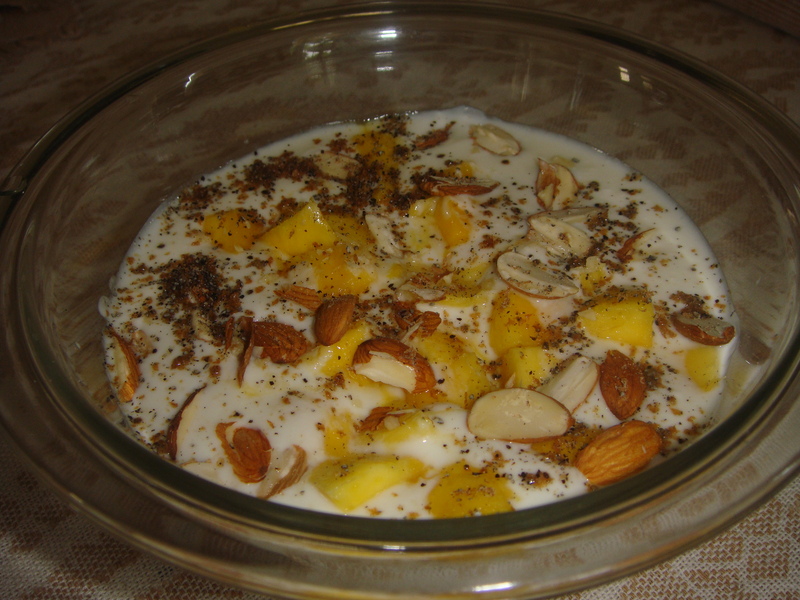 Start off your day right with nutritious breakfasts made from yogurt / curd. Yogurt is packed with the nutrients (like calcium, phosphorus, riboflavin and B12) needed to get us through our morning without feeling hungry. Low-fat yogurt offers an ideal blend of protein and carbohydrates as part of a healthy breakfast. No Flame Cooking! Take curd / yogurt and sugar in a big mixing bowl, whisk curd gently to get a smooth texture of the curd. Peel Mangoes, cut into small cubes and fold into the whisked curd. Add almonds, cardamom powder. * Almonds soaked overnight :Almonds are known for their immense health benefits, and one of the most well-known one is the fact that they help your memory. Packed with essential vitamins and minerals like vitamin E, zinc, calcium, magnesium and omega-3 fatty acids, almonds can do a world of good when it comes to your health. But in order to absorb all those nutrients, the almonds you eat, should be soaked in water overnight. This is because their brown, rough skin contains a certain enzyme inhibitor that is meant to protect the seed until it has the perfect conditions for germination. Our body cannot breakdown this enzyme-inhabiting compound, not only making the digestion of almonds difficult, but also restricting your body from absorbing its nutrients. Apart from that, soaking almonds also softens the seed, making it easy to chew and therefore digest. These seeds are used as a cooking spice primarily in India. Charoli/ charonji/ Chironji are tiny almond-flavored dried seeds of a evergreen tree called Buchanania lanzan, which is cultivated across India, primarily in the northwest. After the hard shell is cracked, the stubby seed within is as soft as a pine nut. The charoli seed is lentil-sized, is slightly flattened and has an almond-like flavour. Though they can be eaten and used raw they are often toasted or roasted before use, as this intensifies the flavour. Charoli seeds are cooling and are used to remove burning sensation from the body. The seeds also act as a tonic to the brain. Charoli seeds are relatively low in calories and are a good source of protein and fat (59 grams per 100 grams of charoli seeds). They contain good amounts of dietary fiber. Charoli provides you with vitamins like vitamin C, vitamin B1, vitamin B2 and niacin. Minerals like calcium, phosphorus and iron are also found in high amounts in these seeds. Mango fruit is rich in pre-biotic dietary fiber, vitamins, minerals, andpoly-phenolic flavonoidantioxidant compounds. According to new research study, mango fruit has been found to protect from colon, breast, leukemia and prostate cancers. Several trial studies suggest thatpolyphenolic antioxidant compounds in mango are known to offer protection against breast and colon cancers. Mango fruit is an excellent source ofVitamin-A and flavonoids like beta-carotene, alpha-carotene, and β-cryptoxanthin. 100 g of fresh fruit provides 765 IU or 25% of recommended daily levels of vitamin-A. Together; these compounds have been known to have antioxidant properties and are essential for vision. Vitamin-A also required for maintaining healthy mucosa and skin. Consumption of natural fruits rich in carotenes is known to protect from lung and oral cavity cancers. It is also an excellent source of vitamin-B6 (pyridoxine), vitamin-C and vitamin-E. Consumption of foods rich invitamin-C helps the body develop resistance against infectious agents and scavenge harmful oxygen-free radicals. Vitamin B-6 or pyridoxinerequired for GABA hormone production within the brain. It also controls homocysteine levels within the blood, which may otherwise be harmful to blood vessels resulting in coronary artery disease (CAD), and stroke. Further, it composes moderate amounts ofcopper. Copper is a co-factor for many vital enzymes, including cytochrome c-oxidase and superoxide dismutase (other minerals function as co-factors for this enzyme are manganese and zinc). Copper also required for the production of red blood cells. Additionally,mango peel is also rich in phytonutrients, such as the pigment antioxidants like carotenoids and polyphenols.